This is such a creative teaching method! The video above tells a short story on how Internet searches work and how to use them effectively. I highly recommend a quick view by all. It is difficult to send large files by email. I’d suggest any files larger than 5MB or so should not be sent by email at all. www.transferbigfiles.com allows you to upload large files to send on to friends or associates. After you upload your file(s), they will send you and/or the recipient a link to download the file(s). Note, the link is only valid for 5-10 days. Click Browse to select your file(s). For example, some photos, a ZIP file, PDF, etc. Type in the person’s email you want to send the files to. You could send them back to yourself, just so you can obtain the link to include in your own email. Check the box if you agree with their terms and click Send It! Note: You’re really just looking for a link (like this: transferbigfiles.com/Get.aspx?id=bb9f4cab-07ec-4ce9-bd7c-7987654fa6a5 ). You can include that link in an email, an instant message, etc to allow anyone to download your file. I’m a fan of MS Office 2007 now after getting use to it. One thing that is cumbersome though is, it saves files in a new format that previous versions of Office can’t open. This is frustrating working in a team environment, or sharing files with other people with older versions. 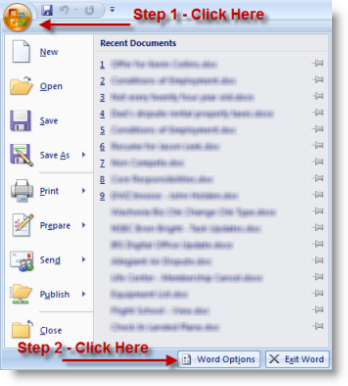 For Excel, follow the same choices above except choose Excel 97-2003 Workbook (*.xls) in step 3. Topics include faster searches, backups suggestions, smarter printing, online reminders, (secure) password management, cable management, and a bunch more.